Browse through these inquiries to find answers to commonly raised questions. We have 6 categories of FAQs below for your use. If you can not find the answer to your questions, feel free to contact us. Goodwill strives to make the donation process easy for our donors, and we are happy to offer this guide to items we can and cannot accept. If you are still unsure of an item you’d like to donate, please contact us. Where does the revenue from the stores go? Goodwill is a non-profit organization, and our mission is to connect Albertans with disabilities to meaningful employment. In 2016, 88.8% of revenue created by our retail operations was reinvested into making this mission a reality. Yes! Wednesdays are Seniors’ Days, and customers who are 60+ years of age are invited to enjoy 15% off regularly-priced merchandise. I saw a great find online. Can I request that the store hold it for me? Goodwill’s policies are created to ensure that everyone has an equal chance to find incredible treasures in our stores. For this reason, our staff is unable to hold items for customers. The best part about shopping at Goodwill is that new items are making their way onto the shelves all the time! Even if the item you saw online is no longer available, there is sure to be something that will catch your eye. I’m looking for a certain item. Do you have it in stock? The inventory in our stores is constantly changing. That’s what makes Goodwill such an exciting place to shop! Because the items in our stores rely on the donations we receive, our staff is not able to anticipate what will be coming out on the sales floor. If you have your heart set on a certain item, the best way to find it is to visit the stores frequently. What is the tag sale this week? 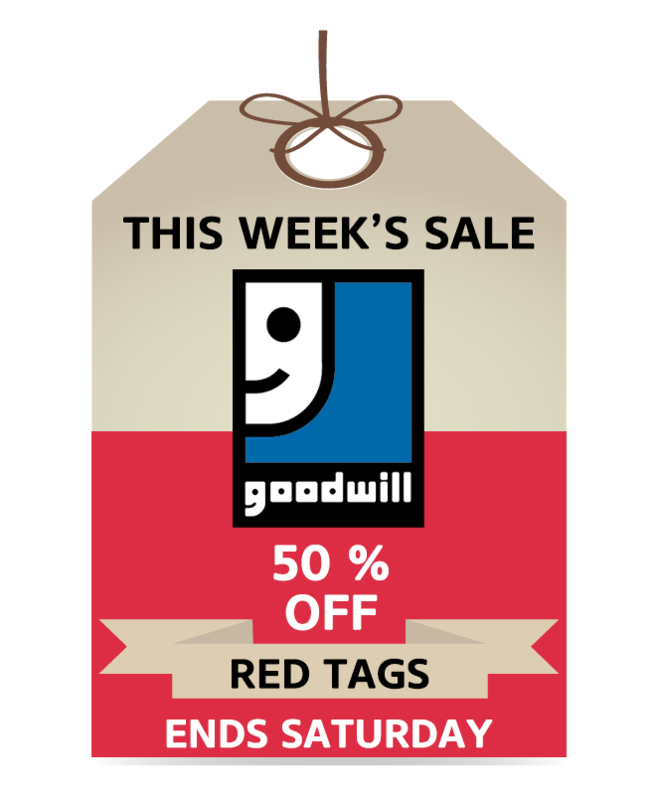 Goodwill’s tag sales offer 50% off of items tagged with a certain colour. The colour on sales changes each week, and you can find the current sale colour on our website’s shopping page and on our Facebook page. Where can I learn more about your programs? 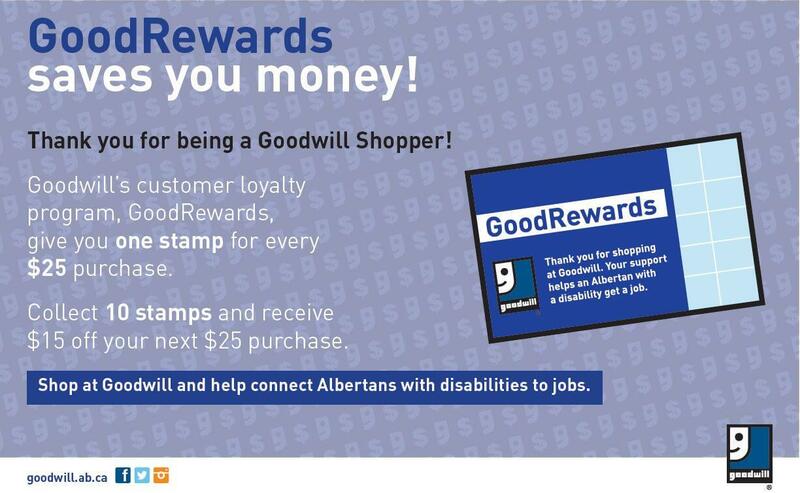 Goodwill operates employment programs that connect Albertans with disabilities to jobs in our communities. These programs currently operate in Grande Prairie, Edmonton, Sherwood Park and Spruce Grove. To learn more about our programs, please visit our Programs page or Contact us. Goodwill also prides itself on equal opportunity employment. If you would like to apply for a position with Goodwill, please send a resume and cover letter to careers@goodwill.ab.ca. Does Goodwill have a food donation program? Goodwill is a non-profit organization that works to connect Albertans with disabilities to meaningful employment in our communities. Our organization is not equipped to help other groups such as those transitioning out of homelessness. If you need assistance, please contact Alberta 211 by visiting their website at www.ab.211.ca or by dialing 2-1-1 on a touchtone telephone. Does Goodwill have programs to help those in need? Where can I learn more about volunteer opportunities with Goodwill? Goodwill is excited to welcome volunteers into our retail operations. Learn more about volunteer opportunities. How can I apply for a job with Goodwill? Our dedicated, ambitious and hard-working team members are the key to our success! If you’d like to join our team, check out our careers page or email your resume and cover letter to careers@goodwill.ab.ca. Can Goodwill donate items to our cause? Goodwill is a non-profit organization that connects Albertans with disabilities to meaningful employment in our communities. Our mission is supported by placing the donations we for sale in our retail stores. We are very grateful to those individuals and organizations who make our communities a better place through their hard work and innovative initiatives. When we accept donations from generous Albertans, however, we believe that these donations are intended to help Goodwill’s mission of connecting people with disabilities to jobs. We become stewards of these donations with the responsibility to ensure they are used as intended. For this reason, Goodwill does not reallocate the donations we receive. Our organization would like to partner with Goodwill. Who can I contact about these opportunities? Goodwill is excited to develop business partnerships that are successful for all parties involved. If you or your organization would like to work with Goodwill, please contact Brenda Hawryluk – Director, Brand Integrity and Business Relations at bhawryluk@goodwill.ab.ca or by phone at (780) 944-1414 ext. 81041. Where can I find the closest donation centre to me? To find your closest donation centre, check out our donation page. What is the process for requesting a tax receipt for my donation? Goodwill is able to provide tax receipts for donations if any one item has a fair market value of $200 or more. Our donor attendants are equipped to manage this process. You will be asked to list the item(s) and their value and the information will be sent to our Finance department. Our Finance team will then send a tax receipt by mail. To ensure your items are valued properly, please bring a proof of value (online sale posting, etc.). Do you take donations of items that are ripped, stained or otherwise damaged? The donations we receive from generous Albertans are placed into our stores for sale, and the revenue from the stores funds our mission of connecting Albertans with disabilities to jobs. For that reason, we ask that any donation of new or gently used household goods or clothing be clean and in good shape (i.e. free of rips or stains). Are there certain hours I can donate? You can find the hours of operation of your preferred donation centre on our donation page. Each of our donation centres also features an after-hours bin for the convenience of our donors, however they are best suited to clothing donations. If you would like to donate furniture or household items, the best way is to stop by while there is a donor attendant to assist you. I accidentally donated an item. How can I get it back? In 2016, Goodwill received over 575,000 donations from generous Albertans! With so many items passing through our doors, occasionally something is donated by accident. If you have donated an item unintentionally, please contact us as soon as possible through our website or by calling the location at which the donation was made. You can find the contact information for all of our locations on our donate page. We make every effort to locate and return items that were donated by mistake. However, our efficient staff is typically able to accept, process, and place items for sale in our stores in less than 24 hours. If you have donated an item unintentionally, there is a better chance to recover it the sooner you are able to let us know. How can I organize a donation drive? Thank you for your interest in hosting a donation drive! Your efforts make a huge difference in our communities, helping to connect Albertans with disabilities to employment opportunities that provide the self-esteem, confidence, and sense of accomplishment that comes from earning a paycheck. The first step to organizing your donation drive is to contact us with an approximate date and location. For events in the Edmonton area, please contact Brenda Hawryluk at bhawryluk@goodwill.ab.ca or (780) 944-1414 ext. 81041. For events in Calgary & area, please contact Stuart James at sjames@goodwill.ab.ca or (403) 401-0960 ext. 86554. Do you have a donation pick-up service? Goodwill does not currently have a donation pick-up service. Goodwill has partnered with College Hunks Hauling to assist donors in the greater Edmonton area who are unable to bring their donations to a Goodwill donation centre. This 48-hour priority service involves a fee, but should be especially helpful to donors involved in major cleanups. Our hauling partner will not only bring your donations to Goodwill, they will clear out your items that Goodwill is unable to accept and take them to another nonprofit or a recycler. College Hunks Hauling will pick up items anywhere on your property. Goodwill is a non-profit organization, and our mission is to connect Albertans with disabilities to meaningful employment. In 2016, 88.8% of revenue created by our retail operations was reinvested into making this mission a reality. I’d like to learn more about Goodwill. Our website is the best place to explore more about Goodwill. If you have questions about the organization, please contact us.